Helping Local Councils create sustainable infrastructure, thus fulfilling Local Agenda 21, The Landfill Directive (1999/31/EC) and the recently ratified Kyoto Protocol. EM (pro-biotic) food-waste treatment has been shown to be the solution to the landfill problem in many parts of the world. Living Soil has catalyzed all the UK trials in this system for both domestic and centralized EM composting schemes, and results indicate an easy adoption and high success rate. Due to the experience living soil has gained over the years we can design and tailor the fermentation composting to the need of councils, local authorities, catering in hospitals, prisons, and schools. We can tailor make documentation, design educational material so this new technology can be rolled out in the easiest way for adoption and easy uptake by many different sectors. • Inactive waste has a lower charge of £2 per tonne. Some 17m tones of food worth up to £20bn a year are being put into landfill, even though approximately 25% of it could be safely eaten by people or animals, or turned into compost and energy. The cost of transporting it and throwing it into landfills is thought to be more than £175m a year. Land-filling of green waste and food waste also involves the loss of an important resource. If treated properly it constitutes a powerful regenerative energy for parks, gardens, and agriculture. Councils can save a great amount of money with employing an EM composting system to deal with the catering waste from public utilities. The UK ranks far behind Europe in vigorously initiating much needed changes to infrastructure. Although composting increased through the 1990s, less than 4% of organic house-hold waste in the UK is treated by this method, compared to 44% in Germany. Because of this sluggishness for the UK to modernize its infrastructure, legislation now indicates that councils must initiate real-world solutions. The Landfill Directive (1999/31/EC) seeks to reduce biodegradable waste sent to landfill to 35% of 1995 figures, to be achieved by 2016. Living Soil has the experience and knowledge to help progressive councils design sustainable and cost-effective infrastructure for handling food and organic wastes that will meet both the Environment Agency and DEFRA (SVS) requirements. Living Soil have helped initiate and pioneer several large scale EM-composting projects within communities, schools and national events, vastly reducing their environmental impact and transforming food waste into a valuable compost for community and ecological development. Read on to find out about Living Soil initiated UK projects. 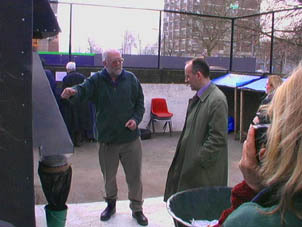 East London Community Recycling Partnership, dedicated to urban waste minimisation, was founded in 2001 and is an umbrella for a large number of organisations who co-operate. ELCRP works closely with local authority officers, social landlords and housing associations. With Living Soil’s consultation, East London Community Recycling Project, spearheaded by Cam Matheson and Jane Wilde developed a food waste collection system that meets both EA and DEFRA (SVS) requirements and is reaching 5,000 households. Because it meets the Animal By-Products Regulations it doesn't require separation of meat and fish from the rest of the organic waste. The system, using EM Bokashi, stops putrefaction, smells, flies and maggots. With good participations rates of up to 84.7% this scheme is going a long way to benefit inner city estates and relieve the pollution and cost associated with food waste. 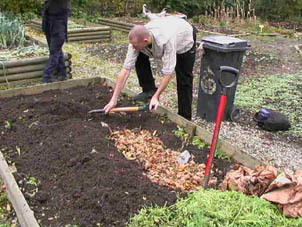 Collecting, sorting and storage of recyclable materials and composting of biodegradable waste (food waste included) is regulated by the - Environmental Protection Act 1990-Part ll; Waste Management Licensing Regulations 1994; Regulations 17 & 18 and Schedule 3; Register of Exemptions from Waste Management Licensing. ELCRP was inspected by the Environment Agency (EA) and was approved for the Sorting and Storage of Recyclables as well as the Composting of Biodegradable Waste, and is used as an example of good practice. 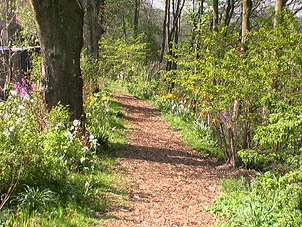 The Coach House Trust is a profound experiment in greening inner-city Glasgow, providing an environment for regeneration. The Trust seeks to challenge the economic and social exclusion of adults who are recovering from mental health, addiction and learning problems. The CHT supports personal social and vocational development through providing training in horticulture, woodworking, fabrics, ceramics and landscaping. As part of their activities, the CHT actively promote composting in the local community. Spearheading CHT is Rita Winters, who endorses the EM method. The occupants of more than 100 Glasgow flats are using bokashi bins which are dug into the local community ornamental beds. All kinds of vegetables, fruit bushes and flowers are grown. The vibrancy of the Trust gardens is remarkable. Tests have found that pathogenic bacteria, such as E. coli, are not found in bokashi bins. This, coupled with the lack of foul smells makes it an ideal technique for dealing with kitchen waste. The CHT scheme indicates how use of EM, combined with connectivity and integration between urban neighborhoods and local fallow land, allotments, parks and gardens, is the key to solving the expensive food-waste problem. The St Christophers School is a progressive school providing a well balanced education for 580 boys and girls between the ages of 2 to 19. "We treat our young people as individuals and aim for them to develop competence and resourcefulness, social conscience and moral courage, the capacity for friendship and a true zest for life." The Healy City Farm collected food waste from the neighbourhood and composted using Bokashi EM for 2 weeks then dug into a test bed. The test beds have now been planted and the results are going to be up soon.